Sometimes it takes a hurricane to get yourself out of a writing rut. For me that’s exactly what happened. I had waited out the hurricane safely in my apartment in West Philadelphia. Though we had prepared by stocking up on bottled water, cans of soup, and a really freaky weather radio, we had power the whole time and even, shockingly, there was no disturbance to our satellite dish. We basically watched the hurricane on TV. I was terrified. The wind was loud, and the rain sounded like doom. I watched my hometown of New York City get flooded. I imagined how I would have gotten to work if I still lived in New York and still had a full time job. I watched the Jersey Shore get smashed. I heard the news of the young woman who got crushed by a massive tree in Ditmas Park, while walking her dog in the hurricane. The dog was fine. That was my old neighborhood. Needless to say, I felt alarmed, helpless, and frightened. We’ve known about climate change for quite a few decades. I learned about global warming in school, growing up in the 80s and 90s. I had always been a nature lover, recycler, Thoreau addict. But the terror of climate change did not really hit me until that experience of being stuck in the house for three days, wondering when and how hard Hurricane Sandy was going to hit. In the mean time, I was in the middle of a long and painful “writing rut.” Since I’d received my MFA in 2007, I had continued writing new poems, but it was a struggle. I was working on revising and rearranging my first book manuscript, which after six years of tinkering with has been a finalist and semi-finalist in a number of first-book contests, but has still not found a home. The new poems I was writing felt disappointing to me––imitations of my earlier work. I kept at it, but never felt enthusiastic about my new poems. My husband felt my frustration and tried all kinds of tricks to get me writing more consistently again. 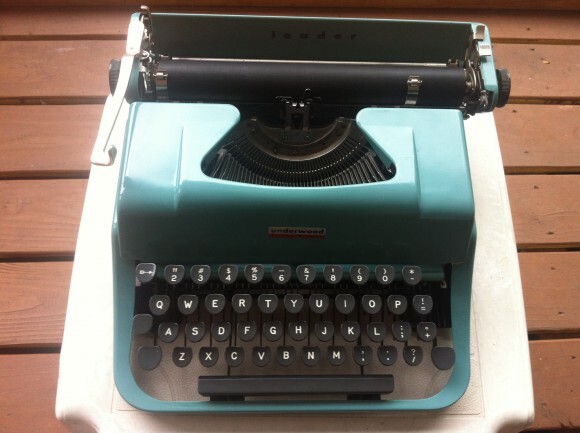 He bought me a beautiful, teal Underwood typewriter off of Ebay. We had even tried doing little writing competitions, where each of us took turns doing a writing exercise (he’s a chemist, not a writer, so it was easy for me to feel awesome when I “won”). 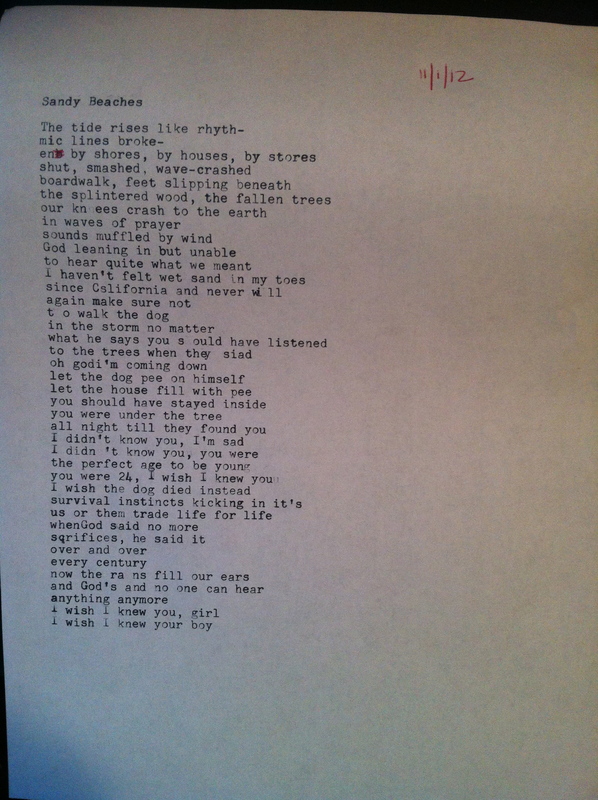 Finally, I started using the typewriter to compose new poems. One of the first that came out was “Sandy Beaches” (pictured, and very much unedited, below). I had finally started to get my groove back. I began writing more poems in reaction to news on climate change. I also began to discover elements of indigenous mythology related to the ocean that led me to writing a series of myth-based poems. It has been amazing to see these poems come to life, as if each one were giving birth to the next. This is the state of flow that I had been missing for quite some time in my writing practice. And I’m basking in the glow of it. So I ask you, dear reader, have you ever been in a writing rut? What has gotten you out of it? I’d love to hear your stories! This entry was posted on Monday, September 9th, 2013 at 12:00 pm	and is filed under Uncategorized. You can follow any comments to this entry through the RSS 2.0 feed. You can leave a comment, or trackback from your own site.